I used to love Jimmy John's. Cheap food, not entirely horrible for you. Not organic or even really natural, but I could pack on veggies and eat something yummy and know it was from a business that started here in my home state. I had seen nothing but good things come from JJ's and I liked how their restaurants were set up. All in all, I figured it was a win-win situation to order from them. Fast, yummy food. And that was fine with me. 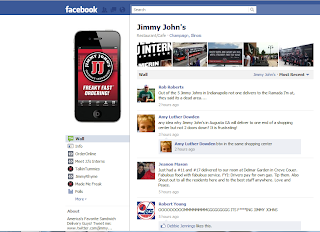 Except then this popped up from Smile Politely, an online magazine from the Champaign-Urbana area in Illinois where JJ's originated: Jimmy John's is a big man. With the photos to prove it. And I won't lie, I kind of choked a little. PLEASE be warned, there are somewhat graphic images. Not horribly so, but if you're like me and happen to like animals - especially ones like elephants and large felines - you're probably going to feel kind of ill.
Now, I want to preface this with a statement: I don't mind hunting. I understand there are some populations of some species of animals that are a nuisance to us both agriculturally and travel-wise, like deer and geese, and I have no problem with hunting these animals. Raccoons, rabbits, squirrels, small birds, turkeys, whatever. Go for it. As long as you aren't just hunting for trophies, as long as you aren't being wasteful, have at. Get your tags, do your duty as a hunter. I may not participate, but I'm not bothered by your choice to do so. But elephants? Leopards? Brown bears? The elephant shown in the pictures at the site above is more than likely an African bush elephant, which while not endangered, is struggling to maintain its natural habitat and is considered to have a conservation status of "vulnerable" which is only one step above "endangered". These are animals that are only, within the last few dozen years, beginning to come back to their natural grounds. They still suffer from poaching in areas where hunting them is illegal. They are still being killed for only their ivory. And since elephants have no real usage otherwise, I will guarantee you that Mr. Liautaud left that lovely corpse (or was it two?) there to rot. Thanks a bunch. And what about that spotted leopard he's shown holding up like a huge children's stuffy? While it isn't yet in the threatened category, it is listed as "near threatened" because excessive hunting and loss of habitat have decreased its natural roaming ground drastically. In fact, experts warn that populations of spotted leopards may actually be extinct in North Africa, making hunting them for sport an unwise move. It doesn't take much hunting to throw a population from "near threatened" to hovering near extinct, as we've found out with too many other animals in the wild. And there's that brown bear. Of all the animals he went off killing - and who knows how many more there were for which we have no picture proof? - the brown bear is the only one listed as "least concern" on the conservation status list. Grizzlies also fall under this status, and I'm no expert: I don't know if the bear in that picture is grizzly or brown. However, don't let their status fool you. At a population of somewhere around 200,000, its range has shrunk considerably in the last hundred years and it has gone completely extinct in some areas where it once proliferated. The movement of humans into areas where we once didn't live so openly has had a lot to do with this. Still, is it necessary to purposefully sport-hunt such majestic creatures who are hovering close to a threatened status? Well, I went and mentioned that article on JJ's Facebook page. You'd never believe what happened: I came back from putting the kids to bed, after politely posting it and noting on there that I was simply curious as to what had happened and wanted to know why on earth he was sport hunting these animals, and found that my "Like" status had been removed, as had my commenting abilities. I can still go re-like the page, but I cannot post anymore. No more comments, nothing. Anything relating to my commentary is gone - as it if never happened. The problem I have with this is that regular people don't get to go spend the amount of money it takes to go safari in Africa and sport-hunt huge animals. Only people with massive amounts of money are given that privilege - and thanks to every single person who has ever purchased from his company, he gets to claim the status of "filthy rich". I know, it's up to you as a consumer to decide who you will and won't support. But remember that it's your money - and if you wouldn't head to Africa or Alaska just to kill some near-endangered animals, I'd suggest not purposefully supporting those who do. If you're wondering if that's really him, it is. Here's a link from an article in another paper with a picture of him for comparison. We're looking at the same guy and those aren't shopped images. Notice that I have no "comment" option link or box showing up beneath any other comments.